Tenor Karim Sulayman took the prize for Best Classical Solo Vocal Album at the 61st annual Grammy Awards, presented last night at the Staples Center in Los Angeles. 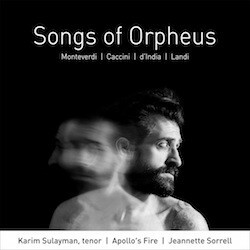 Songs of Orpheus (AVIE Records AV2383), featuring Italian baroque arias by Claudio Monteverdi, Giulio Caccini, Sigismondo D’India, Stefano Landi and others, is Sulayman’s solo debut album. It was recorded with Jeannette Sorrell conducting the Cleveland-based period-instrument orchestra Apollo’s Fire, and was produced by Erica Brenner. “I Love You To Hell And Back” is the Lebanese-American tenor’s neat encapsulation of the Orpheus myth which infuses his solo debut recording. Orpheus, the greatest singer of all time, famously followed his deceased beloved Eurydice to the gates of Hades in an attempt to bring her back to life. He was thwarted by the gods who forbade him to gaze at her during their journeuy back to earth. He could not resist, and the tale has been told in numerous musical interpretations including those of Monteverdi and his 17th-century compatriots who are represented on Songs of Orpheus. Songs of Orpheus is the second AVIE release to receive Grammy recognition in the past three years. In 2016, Laura Karpman’s ASK YOUR MAMA, an epic setting of Langston Hughes’ 12-part poem of the same name, was Best Engineered Album, Classical, and its producer, Judith Sherman, was Classical Producer of the Year. Over the label’s 17-year history, an additional six albums have received Grammy nominations: Lorraine Hunt Lieberson’s Handel Arias; Monica Huggett’s Orchestral Suites by J. S . Bach; The Dufay Collective’s Cancionero; Antonio Meneses’ Cello Concertos by Edward Elgar and Hans Gál; Augustin Hadelich’s and Joyce Yang’s recording of works by Franck, Kurtag, Previn and Schumann; and Nicholas Phan’s Gods and Monsters.